Ever since starting this little food blog a few years back, I’ve been on a mission. Not only to help people to spend less $$ on groceries, but also to help you learn to love new meals and try new foods (maybe that you were afraid to buy because you didn’t know what to do with them). Butternut squash is one of those items that people are afraid to buy because they don’t want it to go to waste because they don’t know what to do with it. Well, here’s what you do with it. You cut it up and you add it to a stew. This is a fantastic, budget-friendly Paleo recipe…one I know you’ll love! Add the olive oil to the Dutch oven and brown all sides of the stew beef. Add the prepared butternut squash, onion, mushrooms, diced tomatoes, carrots and the seasonings. Prepare fresh bread as side dish. 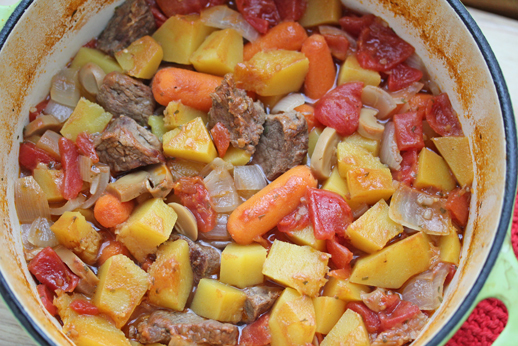 Serve Dutch Oven Beef Stew with Butternut Squash in warmed soup bowls with fresh bread. This recipe is featured on SouthernPlate.com’s Meal Plan Monday #38.